My friend Jeff does not speak Spanish. I mean, he has a few college-Spanish-words in his back pocket but not enough to teach to a bilingual, mostly Spanish speaking audience. And yet, in April of 2000 that’s exactly what he was doing. His teaching partner, Emily, had even less Spanish than he did. She could maybe say “Hola” and “Si, senor”. So, Jeff, a Teaching Artist with ENACT, asked me if I could help him and Emily with a class at the school where he worked. I was born in the Dominican Republic and spoke fluent Spanish. Jeff was a good friend. So, I said, “Sure, I’ll help”. I had no idea what I was getting into. I joined Jeff and Emily as a special guest in the classroom for the entire year. Jeff and Emily swore that the group came alive because I was able to speak to the kids in Spanish. I spoke Spanish. I translated. I learned. As it turned out, it was not only a great experience for the kids, but for me. It was exciting and fulfilling for me to work in the classroom. I had no idea that I could be a “Teaching Artist.” When Jeff first told me that he was a Teaching Artist, I thought it had something do with watercolors. Anyway, by September of 2000 Jeff encouraged me to come work for ENACT officially. He said I was a natural. Early on I worked all over the five boroughs: Manhattan, the Bronx, Brooklyn, Queens and Staten Island, and even in far away and exotic locations like New Jersey! The groups would range from 1st grade to high school, from Special Ed to Regular Ed, with teachers often named Ed. It is interesting and mind expanding to be working in the five boroughs because you get to travel to different ethnic neighborhoods and learn about them through the students you meet. It’s like traveling the world without a passport or the need for extra vaccinations. The vibrant and varying ethnic tapestry of New York creates opportunity to learn and grow in exciting and challenging ways. It is pretty amazing. I found myself playing theater games and creating scenes, helping the kids develop their ability to think on their feet and develop skills in creativity and emotional awareness. Through play and humor we all learned how to work as a community, find our voice, and accept each other as we were. I learned these skills right alongside the kids. Throughout the years I have had so many great moments in the classroom: teaching, helping, mentoring and creating art with hundreds of school kids. I have partnered with amazingly talented Teaching Artists as well as concerned parents who love their babies and only want the best for them. I have given and also received so much from all of them – high on the list: how to make the perfect Sofrito. Many of the kids I’ve worked with throughout the years were also Dominican and they felt comfortable with me. I was familiar. We were all from DR. They would often ask me questions about when I lived in DR and how I adjusted to being in a new country. And they often said my stories would actually help them feel less alone, to know that they too could adjust to living in a new country. My Dominican background was also important when meeting the parents of the Spanish speaking children, who also often did not speak English. I would put them at ease and explain in Spanish what ENACT was. “No, we do not sell mint cookies. Yes, we are a type of performance group. No, we cannot introduce you to Ricky Martin.” Once we got that out of the way, they felt comfortable with me and would often reach out if they needed help with any aspect of their children’s school issues. This rounded support system made the kids more open and trusting; therefore, they would take more chances in class and speak up when they had a thought, a good idea, or the need to express themselves. The more they spoke up, the more I could get involved. It became a circle of care and progression. If you have not guessed by now, humor is a big part of the way I get the kids to trust me. I do not have a problem being silly as a way to break the ice. When I go into the classroom and tell a joke, even a bad joke, the students love that I’m taking that risk and it helps them to relax, trust, participate and take risks too. I once worked with a particular student in the middle school where I am stationed now, full-time, as a Teaching Artist and Site Director. She was part of the ENACT after-school program in sixth, seventh, and eighth grade until she graduated from middle school. When she first started with me she was very shy and was still learning English. It was hard for her sometimes to participate. I started giving her encouragement and extra attention often using humor to get her involved. She went from being a shy young lady who barely spoke English, to President of the United States…okay, I went too far. But you never know. No, she did not become President, not yet, but she did end up being one of our top performers at our annual ShowUp! Gala. 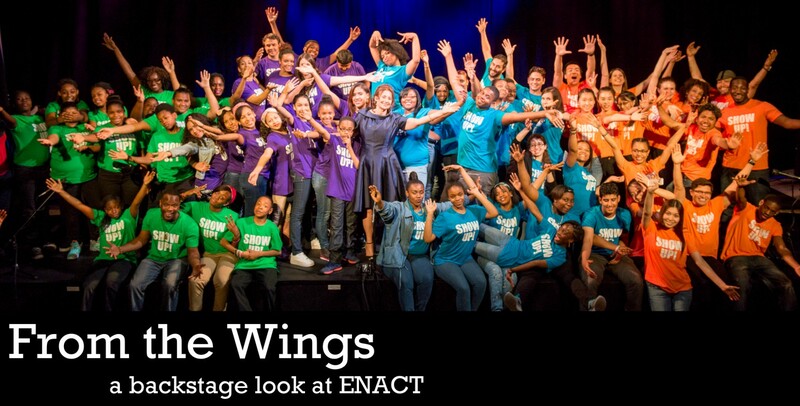 Each year the kids perform original plays in front of parents, peers, and their community to proudly present themselves as kids who show up to school to learn and excel. She speaks fluent English now and was also one of the students selected for Derek Jeter’s Leaders organization for youth. Derek was right, we could certainly use leaders like this young lady. Next stop, the White House. I have had so many students who improved their English and became open to trying new things. Students who have found courage, who now speak up for themselves, their issues, and their educational needs. These skills are especially needed right now and these kids are inspirational to me in this way. On the flip side, it is also a great feeling when you have kids chasing you outside of the school years after they graduate: “Hey! Cristina, the ENACT lady!” It is like being a local celebrity or the Gingerbread Man. Besides celebrity status, this work has truly been a gift for me. It is not only very special when you see a student transform in front of your very eyes, but it also makes you feel proud that you had something to do with it. Like a parent, without all that waking up at 3 a.m. and changing diapers. Being able to give children and their parents some major tools that they can use to deal with the slings and arrows of life has been a gift that keeps on giving. Cristina Hernandez hails from the Dominican Republic and has been a NYC Teaching Artist with ENACT for the last fifteen years. Cristina is an actor, writer, and founding member of the CityKids Repertory Company. She is currently the Site Director and a TA for a middle school in the Bronx. She brings her talents, her experience as a bilingual Latina female raised in the South Bronx, her humor and her heart to every teachable moment in which she participates. Goodbyes can be hard for anyone; they are often connected with sadness, confusion, hurt, or anger. Now imagine goodbyes for the put-at-risk youth with whom ENACT often works. Students who have experienced the death of a parent; students who have been bounced around the foster care system; students who have moved schools each year because funding was cut or schools districts redistributed; students who lost a friend, sibling, neighbor to an act of street or gang violence. You can see why a positive goodbye experience with a loving adult figure could be restorative for these young people who have already faced so many challenges. Yesterday was my last day in the New York City public schools with the young people I have worked with this year. I have provided services individually, in large groups, in small drama therapy sessions, in-school, after school, helping with homework, hearing about test anxieties, exploring fears, and daring to dream about futures. We have covered a lot of ground this year. I know it will only be a few short months before I work in many of the same classrooms again, but no year is ever the same and each kid I interacted with this year has a special place in my heart. It will be odd not seeing them weekly, and I will feel the void. I’m currently carrying one void more heavily than the others: one goodbye that I didn’t get to have. Shanae is a student I’ve been working with in group and individual therapy for most of the school year. While every young person I meet is special, there are some you connect with more quickly for whatever reason. I had an instant bond with Shanae, a very shy girl, short for her age, but with bright brown eyes that flashed with intelligence. Like many of our students, Shanae was struggling with school attendance and so she was assigned to me for therapy. Although I had an immediate affinity for her, Shanae took longer to warm up to me. Our first few sessions were pretty quiet as Shanae avoided eye contact and softly mumbled short responses to all my inquiries. “So what do you like to do for fun?” I asked. “Uhuh” she replied, shrugging her shoulders. “Yeah” she quickly blurted out. Shanae glanced at me and sighed heavily. I had hit something there. “No, not really” she finally responded. Shortly after, Shanae asked if she could go back to class and I told her I would be back to see her at the same time next week. I quickly learned that having a set time to meet each week was difficult because Shanae often did not show up for school. Arriving at school to find that Shanae was present that day was like a small gift, and the more I met with her, the more she slowly started to open up to me. Through our sessions, I learned that her mother was very sick and her father worked two jobs to support the family, so was rarely at home. She was the second of three children and had vastly different relationships with each. Her much older brother was often very abusive to her and her younger brother, taking his anger out on them. He no longer lived with the family but would show up unannounced, so Shanae lived with a level of constant fear about his potential arrival. Her mother did not or was not able to do anything to quell the brother’s temper and Shanae frequently felt responsible for protecting herself, her mother, and her younger brother. She often did not come to school because she had overwhelming anxiety that something bad would happen if she left her apartment. So, at 12 years old, she took it upon herself to stay home to guard her family and her home. Once I knew more of her story, Shanae and I did work around the roles she played in her family, at home, and at school. Throughout the weeks we discussed her feeling like “The Protector”, “The Bad Student”, “The Victim”, “The Good Sibling”, “The Weak One”, “The Unworthy Child”, and “The Survivor”. I explained to her what happened to her physically when she had an anxiety attack. She explained to me her feelings of isolation and hopelessness. We made an action plan for how to manage her anxiety symptoms and an attendance incentive to encourage her to show up for school. After a lot of hard work, and many meetings, Shanae showed up for a full week of school (the first time in months) and we planned to celebrate together. Much to my disappointment, however, quickly after this achievement, Shanae’s attendance dropped dramatically again, making it difficult for us to meet. For weeks I came to the school with a special treat to celebrate Shanae’s attendance achievement, and for weeks I left with the treat in hand, disappointed that I did not see her. Yesterday was my last day in the schools and my last opportunity to meet with Shanae and say goodbye. Shanae did not show up for class. As I write this, I am filled with emotion about saying goodbye to the students I have grown to care so much about. For some, the goodbye is not complete because it did not happen. It will never happen in person. So, I’d like to say my goodbye to Shanae here. And while the message is specific for her, the sentiment extends to all the kids I have seen this year who I will carry in my heart forever. Thank you so much for letting me get to know you this year. Thank you for your bravery in sharing your story and the vulnerability you showed me through your honesty. Thank you for the laughter we shared and the way your eyes lit up when you saw me. Thank you for working so hard with me this year. I am so proud of you for the way you showed up for yourself. I know it was not always easy. I think you are wonderful. You are intelligent, courageous, caring, creative, funny, kind, considerate, faithful, resilient, and much more on top of that. I hope that you remember that you can be whatever you want to be. I hope that you continue to grow and reach toward your own potential and don’t let anyone else’s negative assumptions hold you back. You are special. I’m sorry that you get scared and anxious. I wish I could take that away and protect you. But I also know that you have everything inside of you to overcome these challenges. I believe in you full-heartedly and hope you can find peace and happiness in whatever way that means for you. I’m sorry that you have had to deal with so much already. I’m sorry that you have been thrust into an adult role when you are still so young. I hope the child in you gets to come out and play sometimes. I hope that smiles and laughter don’t get shoved aside for scowls and fear. I hope that you can open up to others in the future and know that there are people who want to help you. You are important. Your story is important. I am so proud of you and so grateful for getting to walk aside you for a bit on your journey. Darci works as a Drama Therapist and the Programs Supervisor at ENACT. She has her Master’s in Drama Therapy from New York University and her Bachelor of Fine Arts in Acting from Missouri State University.